How to rebut Holocaust denial argument? I came across a Holocaust denier who claims that there is a plaque outside Auschwitz which says that the Nazis murdered 1.5 million people there (mostly Jewish). However, the plaque used to say 4 million in the 1940's, then it was changed several times over the years, citing a lower and lower number of deaths. The man I was talking to claimed that the number of 6 million Jewish deaths in the holocaust is fake, because the 6 million figure has remained the same in the face of these substantial plaque changes (from 4 million to less than 2 million). I have looked online and found that this is a popular argument among holocaust deniers, but I was' able to find a source debunking this. What would be the rebuttal to this argument? What are you trying to rebut, that the plaque changed, or that the number of deaths is uncertain? 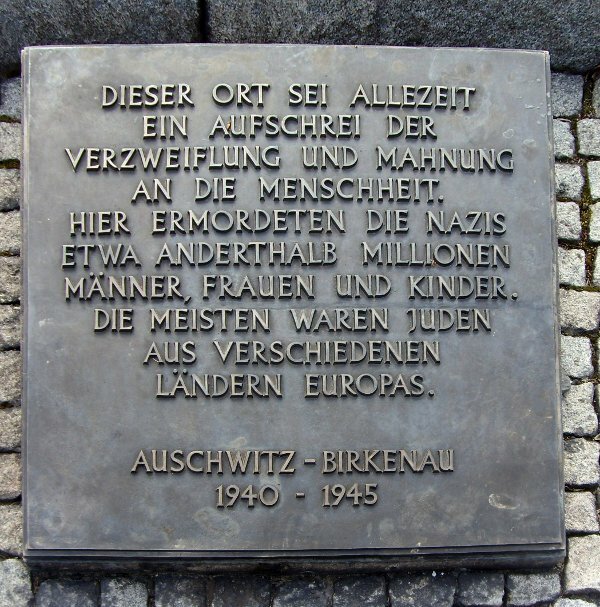 Maybe the plaque originally stated the estimated number killed total, but now it just refers to the number killed at Auschwitz. Without knowing the exact text of the plaque, it is hard to say. The death of 1.1 million is the current total accepted by the Auschwitz-Birkenau State Museum. Rebuttal: just because there is uncertainty in the total number of deaths, does not mean there is uncertainty that there were death camps or that millions were executed in those camps. The right response is to laugh at it. I don't think this can or should be directly rebutted. Arguing details of a theory that is that far from the mainstream implicitly puts it on equal logical ground with every mainstream analysis. This is ceding it ground it has not earned. There are still some first-hand witnesses to the Holocaust around. However, there are less and less every year. So let's prepare ourselves by putting them aside for now. All we really have to go by in History (what we call historiography) is sources. How many do we have? How reliable are they? Do they tend to back each other up, or are they contradictory? In short, how well-attested is the event in question? The existence of Jesus Christ, The Prophet Mohamed, or Gautama Buddha. The existence of Attila the Hun or Genghis Khan. This list could go on and on, because, thanks to its recent vintage, the high literacy rate where it occurred, and the German penchant for bookkeeping, there is almost no event in human history of a similar vintage (or older) and impact that is better attested than the Holocaust. So now you have to ask yourself why, with all of the great scope of less certain events in Human History to chose from, is this person obsessing over this one? If I have to listen to every wacked-out theory anyone with a grudge can dream up to claim all of Human History never occurred, there's no point to recording anything at all. So tell the guy with the weird new theory he just discovered about the Holocaust to submit it to some scholarly journals and get the whole thing hashed out in the historical community. If he can convince them, then you'll hear about it there. The exact number is unknown and will remain unknown. We're talking about social sciences numbers here. That being said, one of the best rebuttals to the holocaust deniers are people like Oskar Gröning, who admitted his part in the mass murder. He can't testify to the total number, but he did testify to the fact that there were mass killings. Regarding the comments to the question, this goes to the core to what history and historical research are, and possibly appropriate to history stack exchange for this reason. An event took place before you were born, how can you know that it really happened? You can try to examine physical evidence. There is some of that, but not everybody can travel to the camps and dig. You can try to examine primary source documents from the era. But again, not everybody will be able to physically handle the originals, and few people are qualified to judge their authenticity. You can read secondary sources. The advantage is that they're available on the web or in bookshops, the disadvantage is that you have to take the author's word that they have examined the primary sources. You look at the reputation of the authors, you compare different authors, and so on, but they could be wrong in their interpretation, either unintentionally or for some nefarious reason. You ask people who were there. The chance to do that is running out where WWII is concerned, and you have to wonder if they are telling the truth. An old German once told me that he, personally, saw groups of people being led into a forest in the East, and none coming out. A court would call that hearsay. He told me that he thinks they were Jews. Not just hearsay but speculation. He says another soldier told him "he didn't want to know what happened to them". Again hearsay. Besides, I'm just some guy on the internet, not a reliable source. You don't even know my full name. But a historian might take this piece of oral history and put it together with many other ones. Easy. At the Nuremberg trials the holocaust was one of the indictments. None of the defendants pretended that the holocaust had not happened, because this was not credible, and they didn't want to concede that the holocaust was wrong. I had nothing to do with it, it was the other defendants. It was self-defence to kill the Jews because [insert mouth-foaming Nazi rubbish here]. The holocaust can't be denied unless basically all history is denied. If you're going to go that far, why not deny that world war 2 happened? After all, you weren't there. They are using "The Auschwitz Gambit: The Four Million Variant"
The argument, "Hey, if the number of deaths on the plaque at A decreases, then the estimates of the total number of Jews killed needs to decrease too" is based on the false assumption that the 6 Million figure ever used the data from the plaque in the first place. You can find the gambit discussed at length (and look up other Holocaust Denial arguments and their flaws at Nizkor (site links below). The 6 Million estimate never used the data used on the plaque in the first place. In fact, scholars at the time pointed out that the Auschwitz plaque greatly inflated the number of those killed. Ironically, those involved did so in order to make the proportion of Jews killed v Non-Jews lower so as to argue that it was more of a slaughter of Poles than of Jews. The 6 Million estimate primarily comes from two different sources that both agree on the magnitude of the Holocaust, Census data and also German records and Germans directly involved in the Holocaust. ― Oliver Wendell Holmes Sr. Reasoning will never make a Man correct an ill Opinion, which by Reasoning he never acquired. Ethnic Hate: The Denialists dislike Jews, Jewishness, Jewry, or less damning, don't like Israel. Or, perhaps they just really like the Third Reich, Hitler and buy into Aryan Supremacy mumbo-jumbo. By denying the Holocaust, they can remove some sympathy from the hated Jews (or de-legitimize Israel's founding), and restore some respect to the beloved Nazis. You typically don't want to argue anything with this sort of denialist. There's no winning. You may occasionally run into a Wehraboo, who in their enthusiasm for history and/or historical gaming, lose sight of the forest for the trees. A discussion of the technical and logistical feats involved in perpetrating the Holocaust, and the sheer scale of it, may get their attention long enough to bring them back to earth with a crash. Contrarianism: They want to believe there is more to know than what they know, they yearn for layers under layers, but are too lazy to realize that the way to find what they want out of history is in resolving detail, not removing masks. The fantasy of secret knowledge and conspiracies to keep them from it is the thrill. There is nothing you can do here in terms of arguing on the merits. You're a part of the conspiracy they're fighting against the moment you engage them on the topic in good faith. You would be much better served in letting them know about the history of Holocaust Denial itself, and the unsavory company they find themselves in. Wikipedia has a well researched section on this, and a regular clown-car full of hateful men who created it and kept it alive. Begin with Harry Elmer Barnes, who got his start absolving Germany of all blame for the First World War in the '20s and '30s, and kept the ball rolling with Holocaust Denialism right after the Second World War. People of a non-European background who don't understand what the big deal is may not have seen pictures of liberated concentration camps. That's usually enough to stifle half-understood conspiracy theories they may have heard from someone who heard from someone. In short, don't bother too much with this project - you're more likely than not dealing with a bigot or a lunatic, neither of which are open to honest debate. without looking it up because it is actually true. Yes, the original plaque claimed 4 million victims (not Jews) and the plaque was changed 1990/1991 (one time, not several times) to the new account of 1.5 million victims. 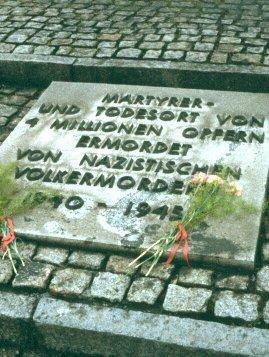 Translation: Matyrers- and death location (sic !, it really sounds equally strange in German) of 4 million victims. Murdered by Nazi criminals guilty of genocide. Translation: This location shall be an outcry of desperation and a reminder of humanity. Here the Nazis killed about one and a half million men, women and children. Most of them were Jews from different countries of Europe. The reasons for the change was also publicized in an article of the German magazine Spiegel. Summary: The number of 4 millions was an approximation of the Soviet era and the number clung on the minds of the people, even after more and more evidence accumulated that the number is really exaggerated. The change of the plaques caused much uproar in the Jewish Community, especially in the East, because many children were taught those numbers in the school and lowering it, even to a more accurate number, always caused the feeling that the Holocaust should be played down. The article bemoans the change, but admits that every decision is bad. The Nizkor cite provided by Robert Affinity also affirms that the change happened and also correctly declares that it did not affect the overall number of victims. It is one really bad problem which shows how poisoned the atmosphere is if people reflexively deny that any claim of Holocaust deniers must be false. This is a trap. Do not fall for it, because then the denier can prove that an assertion is really false and feels (correctly!) that evidence is suppressed or not taken earnestly. Your question also asks how to deal with it. I strongly disagree that you always accuse deniers of falsehood (see above). If you are not interested, simply do not discuss this. There are some counter strategies against holocaust denial which can be employed effectively. Holocaust denial counts on uncertainty: the argumentation should always remain fuzzy and bits of data (everything from outright lies to complete truth) should be framed fitting the denial. Deniers hate to give exact figures and context. "Well, it wasn't millions, only thousands..."
"Thousands what ? Jews, undesirables, prisoners of war...?" "Well, if you claim that the official numbers are incorrect, you must be able to provide at least a more accurate number. So how many ?" "A french author, think it was like Pessac or something"
"Pressac ? He is only talking about Auschwitz and claimed in his book that at the very least 700 000 Jews were killed. So you accept at least 700 000 murders ? By the way, where did you get the 30 000..."
Always get down to the primary sources the denier tries to use. If he accepts an authority, use exactly this authority to prove a point the denier did not want to accept. You will always very quickly find out that the arguments are shoddy, badly understood and cherry-picked. Force them to explain why exactly their sources have a higher standard of evidence than the evidence they try to disprove. Start with a fact which a denier hardly can deny: the November pogroms. It was not only featured in foreign channels, but also by the Reich media: Radio and newspapers. Accepting the evidence that the Nazis committed a pogrom and shared an obvious hatred against Jews (very hard to deny) what exactly stopped them committing a genocide ? They had the power, they had the means, they had the conviction. So what stopped them ? Charity ? Observe the denier. If you have a committed neo-nazi in disguise, they will become quiet and their features will harden because they exactly know that there is no such reason. If you have an uncommitted one, he will think over a time and finally come up with either a ghetto or eviction. Switch to 1. and ask him for the sources where the Jews remained. The claim that the Holocaust is a fiction is one predicated on the myth that Jews around the world are sufficiently powerful as to perpetrate a hoax of such enormity, and that they are jointly motivated by a shared hatred for the rest of the world. In other words, that Jews act in concert to deceive "goyim", gain sympathy, make money and rule the planet. Holocaust deniers tend to assert Jewish control over major media outlets and financial conglomerates, and argue that they control (in some sense) the halls of power. They argue that laws against Holocaust denial prove that there is a conspiracy of intimidation, and that such laws are designed to serve the interests of Jews. Rebuttal: If laws against Holocaust denial service Jews, and if Jews "control" the United States, why are there no laws prohibiting denial in North America? In actual fact, countries with laws against Holocaust denial also have laws that forbid other types of hate speech, and while those laws might be controversial they are based on the very real fear that denial is a form of endorsement. Denying the Holocaust means ignoring or refuting a mountain of evidence too large for any one person to properly explore. I refer to the abundance of material, textual and audiovisual evidence: the vast amount of footage that was recorded (both overtly and covertly), the enormous trove of archived testimony (from survivors, perpetrators and other witnesses), sworn depositions, photographs, documents, reports from contemporary journalists and human rights activists, diaries (of perpetrators as well as victims), etc. To relegate the entirety of this material to the trashcan is to step beyond the bounds of historical revisionism and entire the realm of denial in the first place. To claim that every piece of testimony was extracted under torture, that every document was doctored, every diary entry forged and every photograph a piece of propaganda is to ascribe either superhuman powers to the small group of people who invented this hoax, or to claim that every Allied country was in league with them in the generation of this myth, as was every Axis power that subsequently subscribed to it. It is to claim, in other words, that the world that Jews seek to rule is the small community of Holocaust deniers, since every other person on the planet is a part of the conspiracy. Furthermore, to assert that Jews are possessed of such powers of machination and that the Nazis didn't want to eradicate them is itself logically bizarre. Rebuttal: This argument basically boils down to the claim that the work of every historian is a piece of propaganda, but that the work of the Reichsminister of Propaganda somehow wasn't. In actual fact, the evidence is so exhaustive and the events so well remembered by the local populations of Europe that the number of people who assign the Holocaust in its entirety to the level of a myth tend to be geographically distant from the places it occurred. It's a lot easier to doubt that something happened on the other side of the world than it is to ignore the elderly people in your own community who remember it taking place in their own backyard. Perhaps most offensively for many people, denial of the Holocaust amounts to an assertion that survivors have invented their testimony and are pathological liars. To survivors themselves, to their descendants and to those who know them, this is obviously absurd, but to a population of people who only encounter the occasional survivor and only through online or print media, it may not be so radical an idea. People who hold to this idea will point to discrepancies within survivor testimony, showing how people's stories have changed over the course of time, how they conflict with one another and how they include information now known by historians to be false. Famous examples in this regard include the myths of soap manufacture from flesh, lampshades being made from skin and the feeding of bromide to internees in concentration camps. Rebuttal: Memory is a fragile tool, for which reason police prioritise hard data (like CC-TV footage) over sworn testimony. Question a person after an awful car accident and see how well they remember the order in which different things happened. In actual fact, therefore, we expect the testimonies of trauma victims to be erratic and unreliable. Collusion is evidence for a conspiracy; disagreement and contradiction is not. When Holocaust deniers peddle this material, they tend to favour snappy observations that can be presented in the form of memes - like the observation in the OP's question that concerns the death toll at Auschwitz. Ultimately, arguing with such people (if you are so inspired to do so) is likely to be a fruitless endeavour. The only real cure is education, and there is no longer an excuse for not receiving one. The published material is voluminous, and hundreds of articles are issued every year. Yitzhak Arad, Belzec, Sobibor, Treblinka: The Operation Reinhard Death Camps. We hear so much about Auschwitz that the name has come to serve as a metaphor for the Holocaust itself. Arad's study of these three camps redresses that imbalance. It features extraordinary testimony from perpetrators and is meticulously researched. David Cesarani, Final Solution. Just published this year, this book is highly readable and exhaustive. It contains much material not previously published, and while it has been panned by various deniers online, it is patently obvious that they didn't read it but only cherry-picked its contents. Raul Hilberg, Sources of Holocaust Research: An Analysis. This book comprises an exhaustive list of exactly how much and what sort of information a researcher of the Holocaust may encounter, but serves also as a pretty exhaustive list of just how much material a denier would need to ignore. In terms of this specific claim, you might also mention where the 4,000,000 number comes from in the first place. Rudolf Höss, who served as the commandant of Auschwitz from May 1940 until the end of 1943, testified at Nuremberg in 1946 to the effect that some 3,000,000 people were murdered in Auschwitz over the course of this time. This includes, according to him, about 2,500,000 who were murdered through the use of gas, and can be augmented with the large number of Jews from Hungary in particular who were murdered in Auschwitz after he was replaced by Liebehenschel. Obviously, Höss was wrong. We can now be certain that the number of people murdered in Auschwitz was less than half of what he had estimated. But rather than the original mistaken figure being the result of deliberate fabrication or obfuscation, as the usual people will claim, it actually derives from the testimony of a perpetrator who goes into great detail as regards the nature of his crimes. Not the answer you're looking for? Browse other questions tagged world-war-two historiography jews holocaust or ask your own question. Were defendants at the Nuremberg trial allowed to deny the holocaust? How do functionalists explain the fact that Holocaust continued until the very end of the war? How historically accurate is “Life is Beautiful” when it comes to Jewish extermination? Can we classify holocaust as Hitler's war time strategic mistake? What happened to the overseas wealth of the Holocaust Jews? Which were the most important ghettos during Holocaust? Why do people refuse to acknowledge the Holocaust? Is there a good source for statistics of holocaust survivals? How might someone have gotten a note forwarded from a transport train headed to Auschwitz?